FRP vessels are the right choice for residential and commercial water treatment applications. It is easy to handle and and install. We offer FRP vessels made of vinyl ester/epoxy based material and mult-axiz CNC filament winding machine. They are specially designed to meet the diverse requirements of agriculture and water and waste water treatment. These vessels are excellent in quality and are offered in various capacities. 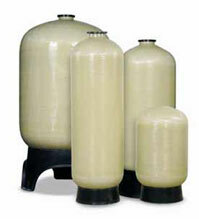 FRP tanks are available in standard polyester or chemical-resistant vinylester construction depending on your needs.